This pictures holds many ideas for decorating baby nurseries with a touch of camouflage while leaving plenty of room for a very modern baby crib. Items in bright colors like red blaze orange (or even pink if the room is for a baby girl) would be perfect accents. Olive drab in this situation is very close to a "neutral" color. Some may say that covering the walls from floor to ceiling with camo wallpaper is a little bit more than a "touch". but once the artwork is in place a very small amount of the paper will be visible. In fact, just enough of the pattern will be showing to complement the stripes of the nursery rug. The eye is naturally drawn towards the bright color of the red baby blanket and the chair and the camo print is visually pushed into the background. This is certainly not a rustic, deer theme baby nursery nor is it a hunting theme nursery that you might expect to find in a log cabin or hunting lodge. Rather, it's a very contemporary space that utilizes a variety of prints, patterns and colors in its design that demonstrates yet another way of decorating with camo. Please upload your camo baby nursery pictures to share ideas with Unique Baby Gear Ideas' visitors. 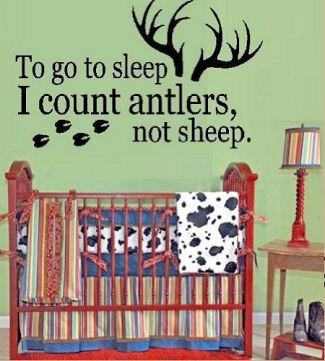 My husband and I do not hunt but love nature and will be including some camouflage in our baby’s nursery. Does anyone have any advices they might share with us for choosing a pattern for sewing projects or tips on where to get a good price on camo fabrics for bedding and curtains? Join in and write your own page! It's easy to do. How? Simply click here to return to Camouflage Baby Nursery Pictures and Decorating Ideas.